Netflix has provided ComingSoon.net the opportunity to talk to comedy director Jody Hill, who started off in features (The Foot-Fist Way, Observe and Report) but has been working mostly in television for the past decade on the HBO hits Eastbound and Down and Vice Principles. Hill talked to us about his work directing the Netflix original movie The Legacy of a Whitetail Deer Hunter, which is now playing on the streaming service! 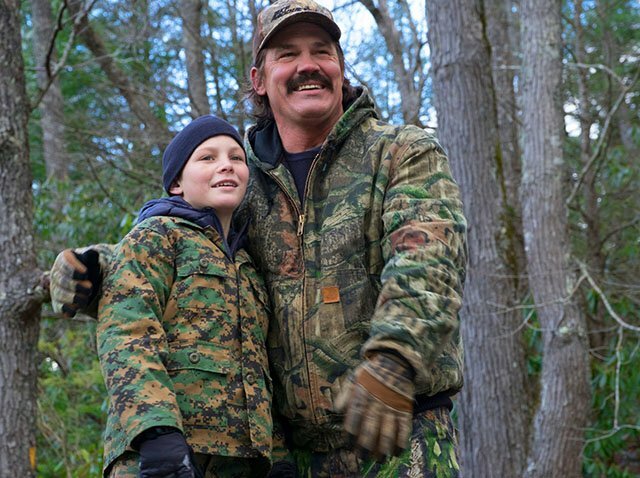 The adventure comedy stars Josh Brolin as Buck Ferguson, a celebrity cable personality famous for hunting whitetail deer, and his estranged son (newcomer Montana Jordan) on a weekend of bonding in the wilderness. 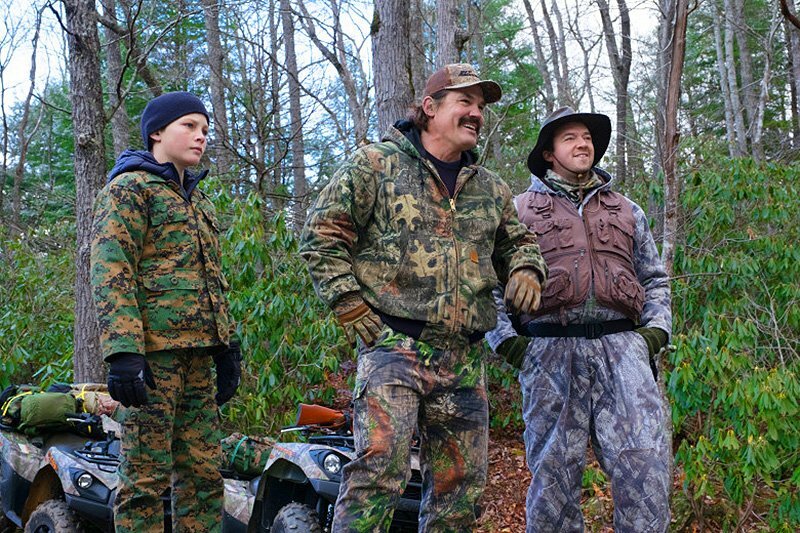 With his trusted but hapless cameraman Don (Danny McBride) in tow, Buck sets out for what soon becomes an unexpectedly epic adventure of father-son reconnection in the great outdoors. ComingSoon.net: The film comes in at a brisk 80-minutes, which is pretty short. What made you decide to cut it so tight? Jody Hill: The story is fairly simple, it’s a father-son story. The father wants the son’s affection and love and he’s trying to get that. CS: Yeah, it’s pretty much a three-hander. Hill: Yeah, exactly. I wanted to tell an old school, “Old Man and the Sea,” man and nature relationship kind of story. It’s also just trimming it, making sure it’s tight. I’m always nervous a film is going to overstay its welcome, so most of films have been in that sort of 80-minute range. CS: I appreciate it! There’s a lot of bloated, 2-hr plus comedies out there. Hill: What’s funny is I actually love long movies! “The Godfather,” the Scorsese movies. I’ve always wanted to make one, too. CS: The thing that surprised me the most was “Legacy” was kind of sweet and tame. It wasn’t as raunchy or outrageous as some of your other stuff like Eastbound and Down or Observe and Report. Hill: It wasn’t necessarily a reaction to anything I’ve done. When the idea came up with my buddies John and Danny we were just like, “Let’s make this kind of a traditional kind of thing, a classic father-son story.” We really liked the simplicity of it, so it was definitely fun to try something different. It was also a script we had initially written sort of after Observe and Report. We had it forever and I’ve been doing so much TV over the years I wanted to make a movie. The script was ready to go, so we decided, “Let’s just pop this out, keep the stakes low and make this movie.” It was kind of fun to do that just because I’d never thought I had to make comedies, it’s just the first thing I made was a comedy so we started going like that, but I never thought about genre too much. I just sort of approach each story differently. I hope to make action movies, dramas, thrillers, other kinds of movies in the future. CS: It’s just interesting that you would decide to go relatively clean for Netflix of all places, where there’s no real ratings system. Hill: (laughs) I wish I had a good answer, to be honest with you. It’s honestly whatever I’m feeling at the time, and I’m really blessed that when I’ve wanted to make something I’ve been able to find a way to make it. Netflix, honestly, was the first place for this movie because it is smaller, and a lot of times…. Especially right now, I mean, movies this size just don’t get seen. Netflix helps people who want to see these movies to see it in an easy ways. CS: The thrust for the film is about this hunter played by Josh Brolin, and he’s a little less a cartoonish buffoon as some of your previous leads. Can you talk about where he came from, if you drew from real life for him? Hill: Sure. I’ve actually never been hunting in my life. John Carcieri, my buddy, he had these videos that his dad sent him of 80’s hunting videos, we were watching them and my mind was just kinda blown. I’m always looking for a world, and this was a world here. A lot of the hunters in the videos were really reverent about the deer and the whole experience of hunting and passing it down from father to son. At the same time in the videos they’re like, “animals are droppin'” and stuff like that. I thought there was something cool to that juxtaposition. I thought broadly about hunting, like, “you go out and shoot a gun and kill something, I don’t want to do that.” But then when I saw the depths that these people think about and care about it, that’s kind of where it came from. CS: You focus a lot on southern characters and southern settings. How do you create these characters without them becoming caricatures? Hill: Well I grew up there, obviously. Again, I never went hunting or knew a lot of hunters. I went to art school. (laughs) With any character, even Kenny Powers, you can take big ideas or something broad that seems kind of wacky, but I like to ask myself, “What would happen if this was a real person?” That’s how I have approached things, because if not I feel like I’m honestly making some studio broad character. CS: Obviously it’s difficult to get these character pieces made. Is there any part of you that would like to do a gun-for-hire franchise type movie? Hill: You know, man, I’ve been approached about that a good bit, actually, and it always sounds like a good idea to some degree. Like, I would love to do that! (laughs) I mean, I would love the experience of having this huge budget and I would love to make some massive worldwide hit. Something’s kept me from doing it so far, but never say never. I think if I found the right one, something I feel like I could have some ownership in in terms of doing things my way a little bit I would for sure do it. I’d love to make a huge movie one day. CS: Is there a property you’d either love to do someday or that you’ve been approached about? Hill: (laughs) I don’t wanna name any specific ones, but I’ve been offered some superhero movies and things like that.